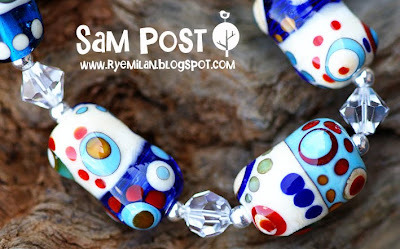 Another little lampwork bead creation for your perusal. 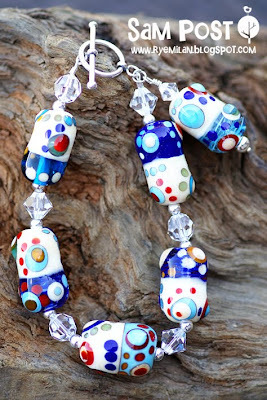 I've used lovely blue and white (and red and orange) dotty focal beads made by Sari at Gaialai on Etsy. The beads are pretty large and decorative, so I've used minimal extra stuff, just a few 8 mm Swarovski beads in Crystal and a couple of small sterling silver plain round spacers. I think beautiful bright cheerful beads like these are going to be my friends through winter this year! I was thinking about dinner tonight, and we are just going to have left-over spaghetti, but I thought I'd mention some groovy herbs and stuff I recently picked up at the Canberra Show. 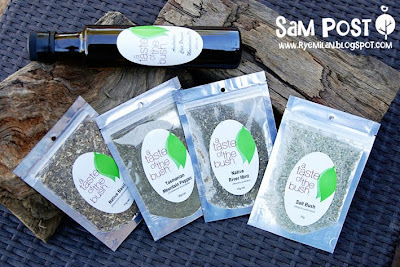 These goodies are from a Taste of the Bush, and we've enjoyed them so much I went online yesterday to order some more...and they arrived today (that's gotta be the super-est speediest service evah)! The recipe on the back of the Salt Bush pack is for a salt bush crusting for lamb fillet...YUMMY. It was actually what drew me to buy them in the first place...I have been looking for different things to throw on the BBQ, and I LOVE lamb fillet (even if it does cost the earth just now at $39.95/kg...is everyone having to pay that price??? Maybe I should move to NZ ;-). It is very good, not too salty, and the kids love it too. Winner! (Blogged to: Blue Monday 88 - New Order and Dreams - Van Halen).